The Encyclopedia Of Nations says that Japanese fishermen caught 4,989,354 tons of fish in 2000. The nation has nearly half a million fishing boats bringing their catch into 2,000 fishing ports around the nation. The Japanese have to fish; most of the nation's land is unfit for cultivation. But is the answer dried sardines? Well, maybe. 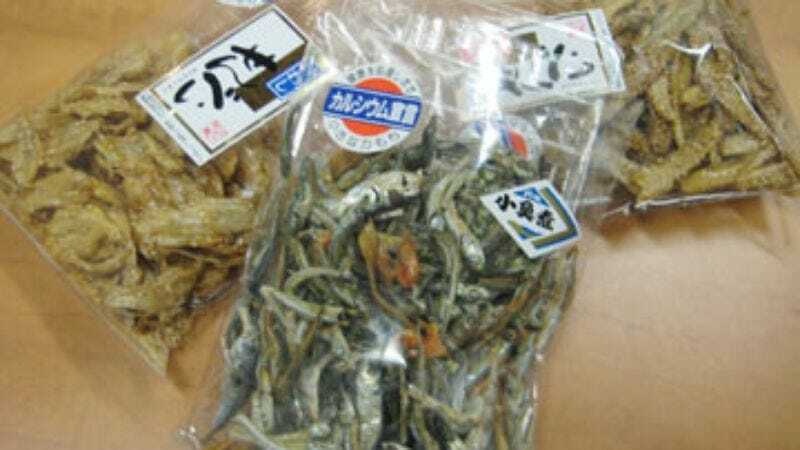 In Japan, fishy snack treats—mmm, eel spine—are ubiquitous, whereas your average American probably hasn't thought about eels having spines, much less what they taste like with a little oil and sesame seeds. But maybe the Japanese find your big bag of K.C. Masterpiece-flavored Jack Link's beef jerky repugnant—did you ever think about that? Of course you didn't, oppressor. The consensus favorite among the hearty, unsurprisingly small group of Taste Testers was the squid. The pieces are quite thin and roughly the size of small potato chips, and they have a satisfying crunch and light-but-not-overwhelming fishy taste. They're the easiest to imagine grabbing by the handful after spending some time in Japan. Of the three items, they also have the least disgusting appearance. The slightly sweet coating gives them a surprisingly bright shine, but also highlights the inner fibers and odd silver streaks here and there. They rank second in the odor department—slightly fishier than the eel spines, but not nearly as bad as the sardines. Oh, the sardines. They were also a consensus-builder, and that consensus was they're horribly disgusting. They taste like fish jerky and smell about as pleasant as you'd imagine, but their little faces were the most unsettling element. Some had their mouths open, making it look like they died screaming. Fish don't scream (right?) but the gaping mouths of some of these li'l guys was enough to inspire some guilt. And their disgusting, disgusting taste has made us wonder if it was worth it. The least smelly and least fishy of the trio were the eel spines, jagged little crunchy chips that had a pleasant enough taste. Well, do they actually taste like anything? We're probably just tasting whatever oil they were cooked in. The crunch is satisfying, though these snacks are awfully sharp and could lead to some unpleasant gum-poking. If you were to imagine food that's designed to get caught in your throat, this is what it'd look like. — "It's like potato chips—just slightly squidy." — "The sesame seeds help. It's visually not appealing—you can see bits of anatomy in here. It's got kind of a glossy, syrupy soy syrup." — "Um….." [Takes long swig of Diet Coke] "You know what it tastes like? It taste like when I eat some tempura sushi and I get a little of the crab shell." — "Squid prevails. I ate two of 'em! That's big news!" — "If you boiled those in water I think you'd end up with a tasty fish soup, though probably a little too sweet. As a cracker, it's something my stomach will probably dread having to digest." — "Why do I feel like the eel spine is going to taste just like the squid did?" — "Ow! I just got stabbed! They're really sharp." — "I don't know, man. I liked the squid more than that. Yeah, this is bad." — "I can't have more than one. They're a safety hazard for children." — "You know how with most meat you eat the flesh and throw away the bones? I'd say this was frugality run amok." — "It's been 10 minutes since I ate those crackers, and I still feel like someone dragged a small rake down the back of my throat." — "It looks like they died while they were frying." — "No way, I can't do it." — "I don't like the shape of this. I feel like it's going to injure me." — "It tastes like fish food smells." — "How about something like this: the sweat of a fisherman's scrotum." — "The fish are just God-awful. The other two were not in the same league. I'm kind of shaking now. It's kind of repulsive." — "The sardines had the added bonus of having their skins intact, which added an oily fishiness to the mix. Hard to chew." — "The Japanese answer to beef jerky. With bones." — "I ate a live aquarium fish once in college. I think the one I ate today might have been its brother." Where to find them: A Japanese specialty grocer in your city? Beats us.